The designations and the presentation of material on this map, based on UN practice, do not imply the expression of any opinion whatsoever on the part of the Commonwealth Secretariat or the publishers concerning the legal status of any country, territory or area, or of its authorities, or concerning the delimitation of its frontiers or boundaries. There is no intention to define the status of Jammu and/or Kashmir, which have not yet been agreed on by the parties. 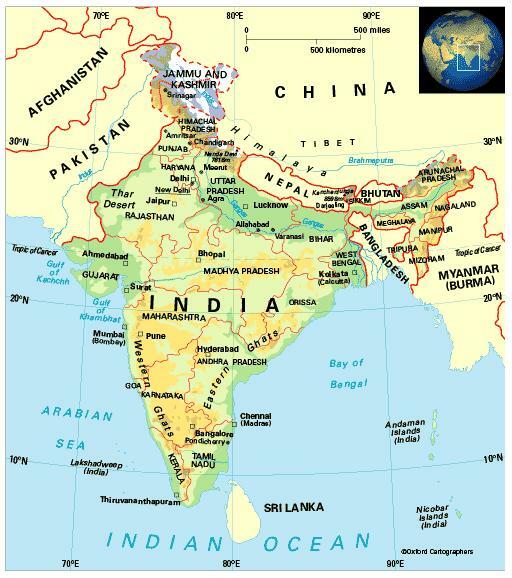 The Republic of India, which lies across the Tropic of Cancer, comprises most of the Indian subcontinent. It also includes the Andaman and Nicobar Islands in the Bay of Bengal and the Lakshadweep Islands in the Arabian Sea. Its neighbours are Pakistan, Afghanistan and China to the north, then Nepal, Bhutan, Bangladesh and Myanmar (formerly Burma). In the south, the Palk Strait separates it from Sri Lanka. India comprises 29 states (including the Delhi National Capital Territory) and six union territories. The climate is hot with regional variations. Rajasthan and large parts of the north-west are dry (under 750 mm annual rainfall) and the Thar Desert (in fact a semi-desert) receives around 300 mm. Four-fiths of rain falls between June and September, the season of the monsoon. April to June is generally hot, dry and dusty. The most significant environmental issues are that finite natural resources support a very large and growing population; deforestation, soil erosion and desertification; air pollution with industrial effluents and vehicle emissions; and water pollution with raw sewage and run-off of agricultural pesticides. 1,236,687,000 (2012); country population is the world’s second-largest, after China; 32 per cent of people live in urban areas and 13 per cent in urban agglomerations of more than a million people. Around 56 per cent of all Commonwealth residents and 18 per cent of all the people in the world live in India. The population growth rate stood at 1.6 per cent p.a. between the years 1990 and 2012. In 2012 the birth rate was 21 per 1,000 people (38 in 1970) and life expectancy was 66 years (29 in 1947 and 49 in 1970). By the late 1990s, 48 per cent of married women were using contraceptive methods. The population of India is extremely diverse, comprising almost entirely peoples who have migrated from other parts of the world over previous millennia. Dravidian peoples, who came to India from the Mediterranean region some 5,000 years ago, now constitute about 25 per cent of the population and live predominantly in the southern states of India. Indo-Aryans, who account for more than 70 per cent of the population, came from Northern Europe 3,500-4,000 years ago. Later migrations included peoples from Central Asia and China. India is classified as a lower-middle-income economy by the World Bank.